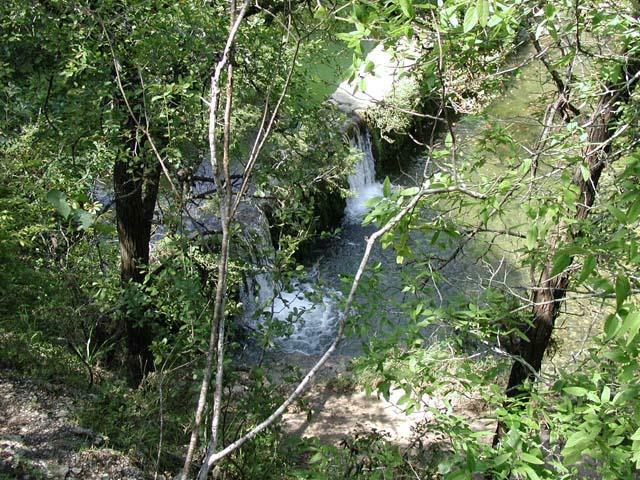 Although the trail parallels Bull Creek for some distance, the dense foliage provides just a few glimpse of the water below, such as this one of the dam. Getting there: The trailhead resides on the north side of Bull Creek between the creek and Spicewood Springs Road. From Hwy 360, take Spicewood Springs west for about two miles. Be on the lookout on the left for a small parking area to the left with a white mailbox. At this spot there is parking for at most 4-5 cars parked parallel to the road. 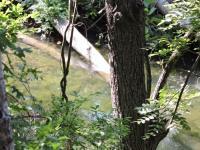 The Hike: The other side of Bull Creek provides a whole different St. Edwards Park than that which hugs Spicewood Springs Road upstream. The terrain here is hillier and more challenging and one never need breath in any auto exhaust fumes at any point along the trail. The trail leading up to the Overlook waypoint provides numerous grand views of the other side of St. Edwards Park below. The trail begins at the waypoint "Trailhead" and heads down a gentle slope to Bull Creek. At the creek strategically placed rocks allow for hikers to cross the creek without having to get wet. During wetter periods wading is an option. 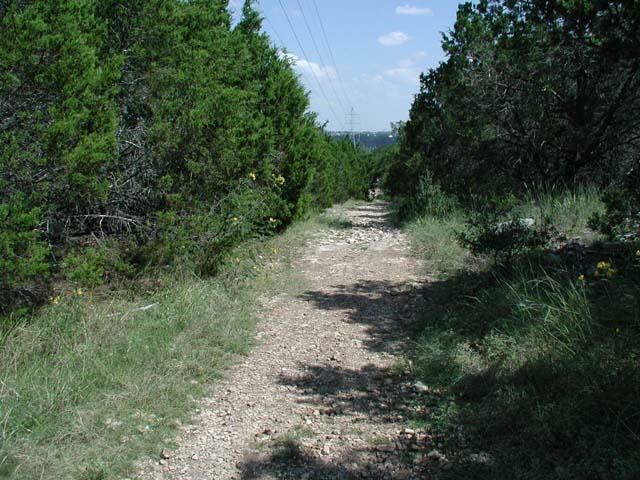 A more dangerous, but drier option is to follow Spicewood Springs Road towards the east a short distance until it crosses the creek and then turns onto the trail that starts there. This is not recommended for anyone with children however. There is NO shoulder on the road or sidewalk and one must be constantly aware of any oncoming traffic and be prepared to jump into the road-side brush at any moment. 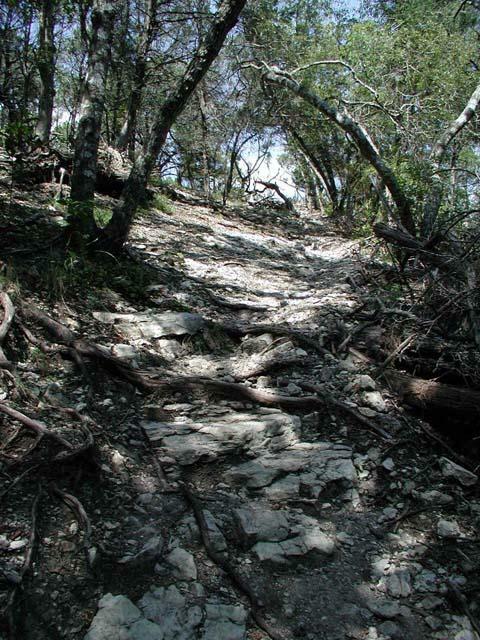 The Hill Trail includes some steep ascents, but nothing that should require using your hands for support. 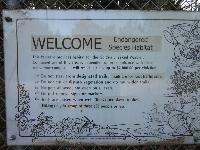 A city park sign on the opposite side of the creek enlightens visitors that this section of St. Edwards Park operates under slightly different rules than the rest. 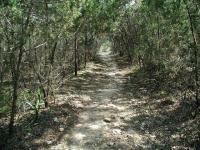 Since it operates as part of the Balcones Canyonlands Conservation Program dogs must be on leashes here. The trail gains elevation as it parallels the creek. Eventually the hiker is rewarded with great views, though with dense foliage partially screening the scene, of the small dam on the creek. 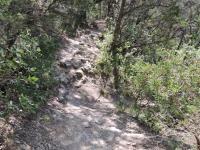 The trail surface becomes more rocky as it continues to rise of the creek. The farther west the trail goes the higher and more impressive the vistas. At the waypoint "Overlook" there is one final view over the lowland portion of the park on the opposite bank before the trail turns away from the creek and starts to climb more directly uphill. 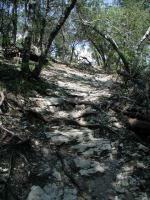 Upon climbing about 50 feet the trail levels off somewhat as it hugs slope of a stream canyon. We continued in this circular, clockwise pattern until we got to the waypoint "T-Right". The trail meets up with a wider trail that presents two options. One option is to turn to the left and head back towards the trailhead and call it a day. If you haven't liked the climbing so far then turning left may be the best option for you. 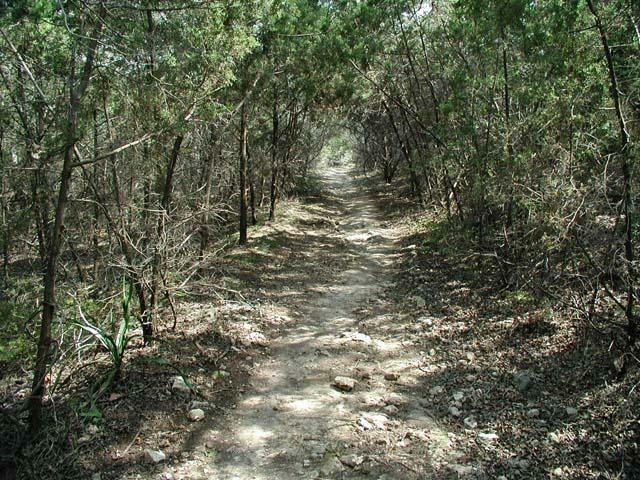 Dense thickets of Cedar provide shade along the trail farther uphill. By turning right we committed ourselves to more climbing. The trail becomes wider and more rocky at this point in the hike. Eventually high tension power lines will loom overhead. Under the towers the trail sets a perfectly straight path right up the hill. The trail near the apex of the park is wider than elsewhere and straight as an arrow, just like the high-tension power lines overhead. 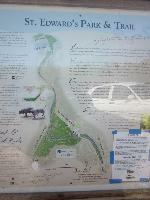 We made a small loop of the trails near the top of St. Edwards Park, marked by the waypoint "Preserve". St. Edwards Park on this side of the creek is shaped like a triangle with this point at its apex. 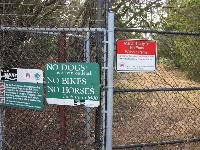 Chain link fences mark the boundary between this park and the preserve land on the opposite side. At this corner there is an entrance into the preserve with signs noting the ground rules. There are miles of trails to explore on the other side of the fence if you have the time. We turned around at this point and took the power line jeep trail straight down the hill, partially retracing our footsteps to the trailhead. The trails on this side of St. Edwards Park are numerous, which provides for a multitude of hiking options beyond what we did during our trip. 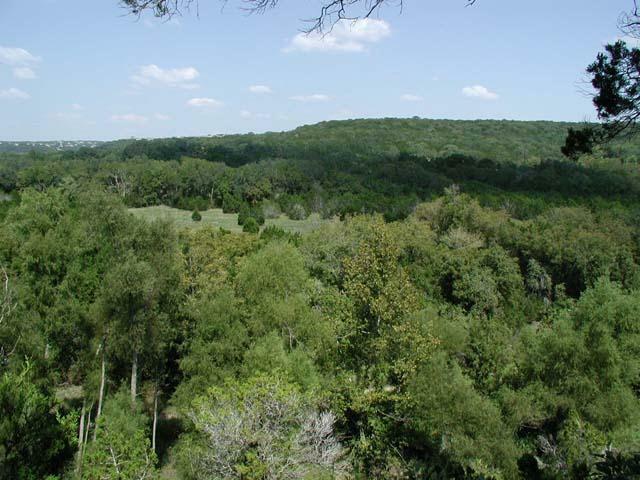 If you like to climb some moderate slopes and want to get away from the traffic along Spicewood Springs then the south side of St. Edwards Park is for you! Parked at the main lot and hiked east to the dam (crossed on the rocks below the dam). Stumbled around a bit trying to find the real trail on the far side--would have been easier if I had crossed by the eastern mini-parking lot. Some of the hilltop views from this trail are really beautiful, and the copious cedars mean that the hike has a lovely, spicy smell. I didn't have time to go into the golden-cheeked warbler preserve, unfortunately, but it was nevertheless quite a nice hike. There are some inclines that are a bit aggressive, which is either a good thing or an annoying thing, depending on your preferences, but in between there were plenty of mostly level bits. Botanizing was a mixed bag--SO MANY junipers and silktassels, over and over--but I did spot a pretty little native orchid and a gnarly old escarpment black cherry, so that was nifty. It was wet today but water here is easy to navigate, as long as you cross the overflowing creek on the road. Walked the loop gping right. 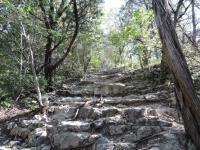 We had lots of fun crossing Bull Creek and then climbing the trail up to the south. My son was excited by the quick elevation gain up to tree top level. We followed the creek around until we encountered a barb wire fence. Went back downhill along the fence, crossed back over the creek and followed a creek-bed trail back to our previous crossing. Made for a quick mile and a half loop. BTW, we parked at the larger, more northern, parking lot. There is a quick, easy connection trail to get down to the creek. After doing the creek trail this one pooped us out. The rocky trail kept us slow, but we made it to just about the top of the hill before turning back. Only saw one person on this trail. Will return again to finish soon. Hiked the hill side of the trail at St. Edwards Park after parking along the roadside on Spicewood at the 5th low-water crossing. This was our first time at the park and I was accompanied by another friend and our 3 daughters ages 4, 7 and 11. 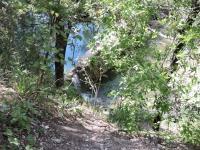 We walked along the creek and saw crossed at the dam to the other side of the creek. We followed the trail and it led us around and up the cliff side of the creek. The views were very nice and the kids were all able to handle the ascent. We continued along the trail until we reached the fenceline on the south side of the park and headed towards the preserve. The descent started as we turned left at the preserve entrance. 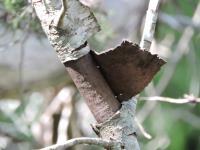 We saw one warbler and lots of vegetation and found some fossilized sea shells along the way. We all enjoyed it and will be back for sure.